Walk on ancient roads in Ireland on this escorted tour of Ireland's West Coast ! 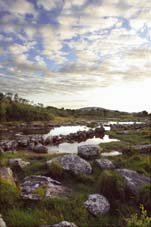 If you have ever dreamed of an Ireland vacation tour then make it a reality and join us either in May or September 2007 on this luxury custom hiking tour. The West Coast of Ireland was made for walking with its rugged beauty, unique geological formations, and Irish heather-covered countryside! Diversity is the key to the Irish landscape and is great news for walkers. Ireland’s endlessly fragmented coastline is one of its most treasured features, where sandy coves, turquoise bays, peninsulas and headlands await discovery on this escorted walking tour of Ireland. Immerse yourself in the great outdoors of Ireland as you travel on foot by day, and stay in first class inns, enjoying world class dining each evening. You will surely enjoy the balance of fresh air all day and an oasis of comforts at night. A day of hearty walking in the crystal mountain air will certainly ready your appetite for a cozy roaring turf fire, and the best of local foods of the region, all with wonderful Irish hospitality. Enjoy the camaraderie of the group as we share tales of the day over a pint of Guinness while listening to traditional music. Let Fiddlehead Tours take responsibility for all the details of selecting the most scenic walking paths, and the finest accommodations, so that your escorted walking tour of Ireland will be an unforgettable combination of stunning sights, fitness, and scrumptious food.